The market leading iDrive® LED driver range now includes the 300W iDrive® Force 12 Silent, which is designed for situations where fan noise is undesirable. It is the first LED driver to integrate an advanced control system alongside a powerful 300W driver stage, which can control up to 12 independent output channels with the widest ever range of dimming control protocols. 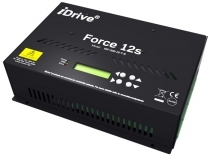 The Force 12 Silent can be dynamically configured to use DALI, DMX, RDM, Art-Net 3, Art-Osc, sACN & HTTP dimming protocols, whilst being able to monitor external occupancy and ambient light sensors, without the need for expensive external control systems. Advanced control technology enables users to dim the constant current fixtures in 8-bit or 16-bit mode, giving unprecedented accuracy for dimming and colour control. The Force 12 Silent utilises the patented Hybrid+™ driver technology, which has been designed specifically to deliver healthy lighting for both humans and animals alike. The Hybrid+™ system avoids current pulses to dim the outputs and thereby mitigates the risk of headaches, migraines, eye strain or visual impairment, which can be caused by long exposure to common PWM-based systems. Integrated System Technologies (IST) Ltd. are global pioneers in the design and manufacture of world leading, intelligent iDrive® LED drivers and Serenity Lighting® healthy & flicker-free LED lighting solutions for commercial, office, architectural, retail, entertainment, outdoor, amenity and domestic white light and RGB-W/A applications.